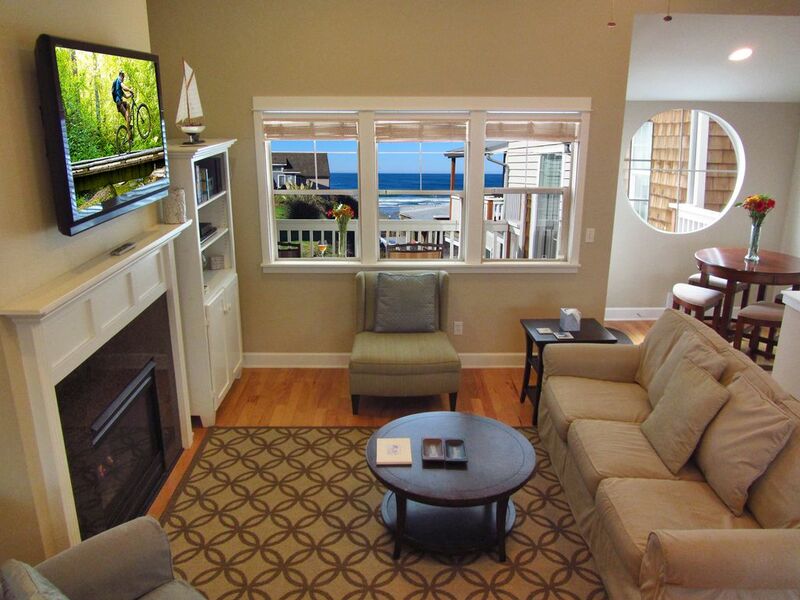 “Nye Beach Arch Place” is a beautiful, well- equipped condominium with all new furnishings. The living space provides a contemporary open kitchen, dining, and living room on the upper floor to maximize the ocean view. The lower floor has two bedrooms, one with an ocean view, and two baths (with another half bath upstairs). A great place for couples, small families, or groups of 6 or fewer, looking for a memorable place for a special occasion or just to treat yourself. A few steps down Beach Drive to the beach, with terrific restaurants, shopping, and art galleries at your doorstep. The vaulted living space upstairs has a gas fireplace, comfortable seating (including a queen sofa bed), and a 47” flat-screen high definition TV. The luxury kitchen is outfitted with stainless appliances and granite countertops, including an island with a counter height bar, plus large dining table. A door off the living room leads to the balcony, where you can sit and enjoy the ocean view. The two bedrooms are located downstairs, along with two bathrooms and full laundering facilities. The master bedroom has a king bed, armoire with high definition TV and DVD/VHS player, and an attached bathroom with two-sink granite countertop, and tiled shower enclosure and tub. The second bedroom has a queen bed and an adjacent full bathroom with granite countertop, and tile and glass shower enclosure. - The BEACH!! Walk barefoot in the sand, or watch a sunset from the benches above. - Peruse books at Nye Beach Book House, try a bowl of chowder at The Chowder Bowl (my favorite chowder place! ), share one of Café Stephanie’s famous chocolate chip cookies, and find a bottle of wine to bring back for a cozy evening in front of the fire. Steve and Marla Bennett, property owners. As a family, Nye Beach has always been our favorite destination on the Oregon coast. The easy beach access, great restaurants and so much available right around the heart of Nye Beach. One reserved parking spot. Additional street parking is convenient and free. 47” flat-screen high definition TV in living room. Smaller flat screens in both bedrooms. Enjoy the ocean view with a glass of wine! The bedrooms and full bathrooms are downstairs, but the living space is upstairs (kitchen, living room, half bath). Portable crib (Graco Pack 'n Play), Booster seat with detachable tray; kids books, puzzles, videos, toys. Had a pleasant week at Nye Beach. Condo is spacious with a nice floor plan and adjacent parking for one car. Owner Marla was very helpful and responded immediately whenever we contacted her. We would rent this condo again. This was a great rental. Our family loved that we could walk to so many shops and restaurants and the beach! It was clean and well-appointed, which made for a comfortable stay. We plan to go back! Modern, comfortable unit in the heart of Nye Beach. Steps from shops, coffee shops and restaurants and the beach. Nicely furnished and bright. Very comfortable for a family. Great place for a stay in Newport. A super comfortable, wonderful, convenient vacation get-away! Our family of four greatly enjoyed the cozy, clean, wonderful apartment. The beds are very comfortable. The space heaters keep the bedrooms and bathrooms toasty warm in wintertime. The common areas upstairs are great for relaxing. The kitchen has all we needed to prepare great meals just like at home. And the kids love the giant stuffed teddy bear, which is still bigger (and softer) than my 8 year old son. The apartment is conveniently located... we could walk downstairs to coffee shop, convenience store, ice cream store, Irish pub, bookstore, and of course Nye Beach and the ocean about 150 yards away. 2 minutes drive to Thriftway grocery store, 5 minutes to the Bayfront to see the sea lions and other tourist stuff, and 10 minutes to the awesome aquarium, great South Beach State Park and more. Weather at the ocean in November can of course be rainy and cold, but is often beautiful and mild. We got some rain, but also had a lovely 60 degree day frolicking on the beach and playing disc golf at SBSP. Thanks Marla for providing what we needed for a great beach vacation. We definitely look forward to returning! 4 nights in the center of Nye Beach was just right. Easy walk to the Tap House and to the beach. Arch Place is a lovely townhouse in a great location. *Minimum stay does not apply if fewer days are available between other reservations - please inquire using 'Ask Owner a Question' link or call phone number listed in Owner section towards top-right of listing. *Major holidays, spring break, and seafood and wine festival are also subject to high season rates. *Currently only booking 18 months out, but please inquire if you have more extended needs.